Click to viewWash away your dark side every morning with a Darth Vader Molded Coffee Mug, and let's hope there's not a tear in the space/time continuum because you're eating cookies out of this Shock Trooper Cookie jar at the same time. It'll work fine—we're all a combination of good and evil, anyway. 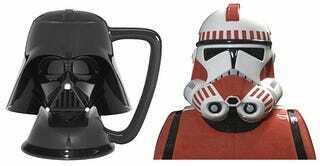 Darth's molded plastic coffee mug is $17.95, and the ceramic 12-inch-tall shock trooper cookie jar will cost you $49.99.